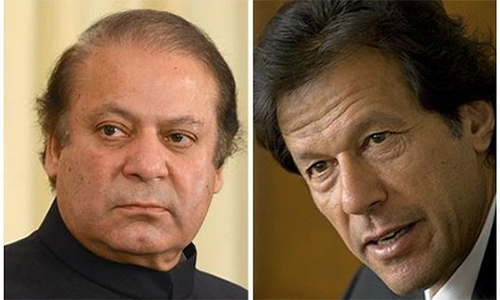 LAHORE: As the Supreme Court is going to announce the much-awaited Panama case verdict tomorrow (Thursday), the ruling PML-N weighs the option of early election in case of an adverse decision while Pakistan Tahreek-i-Insaf expects disqualification of the premier. “The option of early election (this year) is being discussed by the leadership in case the apex court’s decision affects Prime Minister Nawaz Sharif,” a PML-N insider told Dawn on Tuesday. He said there had been two points of view in the party in case of adverse verdict; one supporting the option of going into early election so that the PTI could not exploit the situation. This camp believes the party can easily retain its present position in next polls. The other group in the PML-N is against going for early election. “We should complete our tenure no matter what the decision is. The party should go for the option of replacing PM Sharif as early election will not be a good option,” he said, adding the top leadership had sought the views of all those party stalwarts who mattered. Punjab Law Minister Rana Sanaullah who is a close aide to Chief Minister Shahbaz Sharif said the party was quite optimistic that apex court’s decision would not affect the prime minister since his name was not in the Panama case and there was no evidence of wrongdoing against him. “However, in case the decision somehow affects the premier I am of the view that we (PML-N) should go into the polls as per scheduled in 2018,” Sanaullah told Dawn. 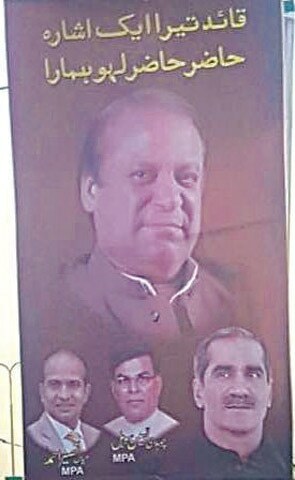 Meanwhile, PML-N legislators have displayed flexes in favour of Prime Minister Nawaz Sharif in the city. The wording chosen by Khawaja Saad Rafique, Yasin Sohail and Mian Naseer Ahmed is quite suggestive. “Qauid tera aik ishara hazir hazir lahu hamara (Chief we are ready to shed our blood on your call). Different PML-N hawks want the apex court give ‘clean chit’ to their leader in the Panama case. They say the people will not accept the court decision if it is against their leader. 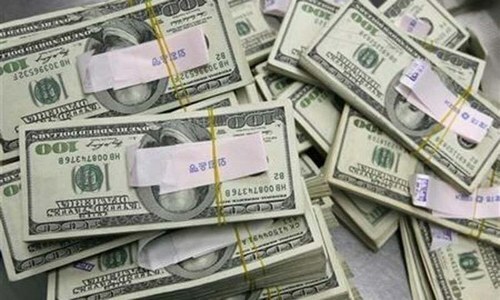 A PML-N official told Dawn that his party would not give the field to the PTI to cash in on the Panama verdict. “Though we are sitting silent right now, we have our plans to deal with the post-Panama verdict situation,” he said.On the other hand, PTI, the main petitioner in the Panama case, said it was very excited and hopeful that PM Sharif would be sent home on Thursday. “We are expecting Prime Minister Nawaz Sharif’s disqualification in the light of evidence presented against him in the court,” PTI Secretasry General Jehangir Tareen told Dawn. 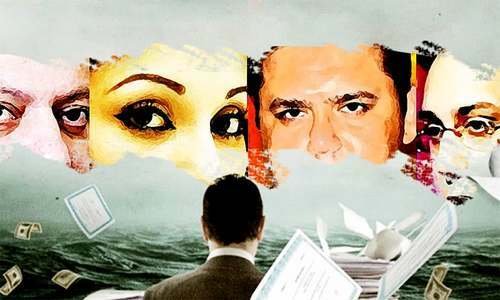 He said except the Qatari letter which also had no legal value the family of the premier could not present anything substantial to defend itself in the Panama case that revealed the off-shore holdings of Nawaz Sharif’s children. “Hudabia case of money laundering will also be re-oponed in the wake of the apex court’s verdict,” Tareen said, adding the PTI might hold a series of public meetings and rallies after the decision. “The party leadership is holding an important meeting on Wednesday (today) to discuss its post-Panama verdict strategy,” he said and added the decision would have a far reaching impact on the country’s politics. Jammat-i-Islami chief Senator Sirajul Haq said the Panama case decision would result in a “major change” in the country. “It is hoped that the decision will help stamp out corrupt system. April 20 will be remembered for the apex court’s land mark decision,” he said. Change is about to come. Pakistani society is changed now. Traditional goons and thugs still believe in the old tactics but there is no place for such nefarious designs. We are all holding our breaths. May justice be seen to be done. Back to London or Dubai Palace. They should consider for once respecting the law of the land.....how about discussing that option. The senior management of PMLN will be trying to out do each other by exemplifying and issuing bold statements in favour of NS. There must be a scoring system and a prize for the winner. no matter what the verdict would be , i think it will be a win win situation for opposition and will be a disaster for PML-N.. even the govt and the Pm knows it !!! NS has become PM thrice...but he failed to learn form his past mistakes! In case the PM is disqualified, isn't there any competent person in the party who could become PM or whether the PM would accept a person of his party occupy this position. Corruption should enda There is no other choice! running away from pakistan. another option. Our gallant arm forces should take their positions in every part of the country from Wednesday night for any untoward incident after the verdict of the supreme Court to save the life and property of the people. Whether 'ts nobler in the mind to enjoy millions and billions of outrageous fortune...abroad. In case of adverse verdict? There is no possibility of the verdict not being adverse, it is simply a matter of how adverse. 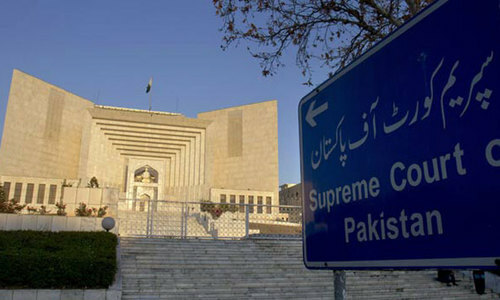 No matter how many posters they display, it will be of no avail, SC justices have taken their time in tightening the noose, fully realising their responsibility, to uproot the current cleptocratic autocracy dressed up as democracy, and the hegemonic strangle hold of the status quo of loot and plunder, to rescue the country from an impending social, economic and political implosion. i think PML n is near to enter in dead end street. If Pakistan wants to move forward. These politicians must get real justice. .... either country will be cleaned from corrupt leaders or corrupt leaders will be cleaned in the country. I'm hoping against the hope. Early election strategy didn't work for N in 93, so they should not try that again. It'll be interesting to see what PTI will do in case verdict goes against them, another dharna?? pti is a legendary party. we supporter of pti will accept verdict of court. we believe on our supreme court. they will scrutinize the good and bad. by posting such slogans, Mr saad rafiq is giving message /threat to Justice system of pakistan, and for any country justice system is the foundation, i wonder why these people have double standards and why they take word democracy all the time to bluff people.if they are really care about Pakistan and its people, they should not put this message on street. The banner reveals the whole story from the decision to reaction. But I don't think he should even try create unrest in case of the decision came against him. What else can they do to stay in the limelight? it is my gut feeling that the verdict would NOT be in favour of Nawaz Sharif and would be written in a way that he would be obliged (ethically) to resign and choose someone else as PM. Nothing will happen, when people like Dr Asim walk free after there being evidence of them being involved in corruption, Sharjeel Mamon having looted sindh of billions, moves to Dubai, lives a lavish life and then comes back, what hope does Pakistan have. Whole nation is waiting for verdict.lets pray to God that the verdict bring goodies for pakistan and we get rid of corrupt mafia of politicians. Whatever the decision of Panamagate Scandal is, my appeal to all compatriots, please stay at your homes tomorrow as much as you can. Whoever will be the loosing party, will cry foul and anti Pakistan elements will take full advantage of the situation. As per history, there can be riots, looting, killings (God forbid). Please stay at homes tomorrow, and if possible, even a day after. Whatever the verdict, it will have no bearing who rules the country; Pakistani people are not yet ready to join the other progressive countries. Nothing is too low for them. Sind will always be ruled by the Zardaris, Punjab will again elect the same corrupt N league. The real problem facing Pakistan is not the corrupt leadership but it is the people. Today they (N-league) are thinking about this, all credit goes to Imran Khan. He proved himself as a solid wall against corruption. 2 minutes silence for ppl seeking the change; do u know Mr.Tareen son also named in Panama as Mr. PM son. @ihtesham ali what about ordinary thugs in the society. You have to eliminate corruption from its roots. People of Pakistan needs to change, become good human. We should remember that this case is not a win or lost fight on the part of IK & Sharif. This is about our future and all along with it. I pray may this verdict streamline the future of Pakistan. If the verdict is not in favor of PMLN leadership then instead of doing everything to ensure everything to stay in power, all the PMLN politicians should instead feel ashamed of the kind of leadership they were defending! They should introspect and then either quit politics or instead seek apology from the entire nation. I believe the chauvinistic voters are the real issue here. Be it PPP or PML N, they will not change their mindset. The dilemma is that after all this insult in Panama case, PML N has won in Tala gang polls yesterday. 9000MW power shortage. If these corrupt leaders are not going to be dealt with then expect more or less of the same mismanagement. It would be much appreciated if Apex court also draw outline about politicians promises/manifestos these politicians make while begging votes from public and also judge their promises viability and transforming of it into reality. declaration of their and their blood relatives assets before coming into power and after leaving government. Thank you IK for fighting against these corrupt mafias. For showing Pakistani people that a corrupt person can be held responsible even if he is the sitting PM. Thanks for showing us that we are not a bunch of animals owned by these looters and crooks. Thank you. Whenever Pak economy is ready to take off, some miracle happens to stop it. Let us wait for the decision tomorrow while keeping gingered crossed. Whatever the verdict will be. Thank you Imran Khan for taking the most richest and powerful person in Pakistan to the courts for accountability. Will love and remember you IK forever! @Kesar: you are right brother. We ourselves are responsible for our misery. Why we vote for PPP/PML-N or Other corrupt parties. But one more thing.... Democracy is best for an educated society; and not for Pakistan like state where ignorance prevails and emotionality and Shaksiat Parasti rules... This harsh reality. We dont think Nawaj ji is wrong. He has contributed his entire life for the welfare of this country. It appears he is being conspirated by the opposition. But Nawaj will come out victorious as usual tomorrow. Let's hope the descision will have positive impact on the people of Pakistan. Ya Rub. May the courts show courage and help correct the corrupt system. @Azmeen "Whenever Pak economy is ready to take off, some miracle happens to stop it." When was that? Did I miss something? Our Hon five judges will create history if the verdict is against the sitting PM for his corruption and will be remembered for a long time by the poor people of Pakistan and its future generations. @haseeb "Mr.Tareen son also named in Panama as Mr. PM son." IK said PTI would accept the verdict. Either Tareen will be saved or NS will go, either way PTI wins!!! @Bilal khan IK did not take NS to court. It was NS who himself volunteered to offer himself for accountability! and waved his fundamental rights. When has IK done that. He usually hides behind adjournments for one reason or another. Election Commission can tell you all about it. Mian Sab won't be able to complete his third term in office like previous two. "Qaid tera aik ishaaraa", even this slogan is a theft/plagiarize from a Sindh based party ! @haseeb His Tareens son did not loot any money from the public funds, as with NS and his sons, how did they become CEO's at the age of 13, and amass a property portfolio in the most expensive neighbourhoods of London. I am from a wealthy land owning family of punjab, and even I cant afford to buy in these neighbourhoods, so the argument that they come from money should be out to bed. The verdict will be with the aspirations of the people of Pakistan. The corruption of the few families will be exposed and that is the winning point. PML-N is 'Pakistan Muslim League -Nawaz'. If there is no Nawaz in the party, there will be no PML-N.
@Dr. Salaria, Aamir Ahmad "What else can they do to stay in the limelight?" Who Doctor? The "movers and shakers"? @Azmeen do u know the meaning of economy??? @Azmeen: Dear Azmeen....Firstly, for your correction please refer to our country literacy rate- very Low compare to developed nations. Secondly democracy is best for people who keep good decisive minds rather than emotional hearts. @Mahrukh "Now what's your choice?" Off course if you omit the natural choice, there is no choice. Oh, come on! Do you want us to believe the govt. does not know already. This is Pakistan. @javeed - "What a joke is that! If corruption of PM Nawaz is proved & verdit is given aganist him! I wonder which hearts will he rule, "
Hearts of corrupt people!! we have many in the country!!! Early election would expose the drama of democracy. If I am not the PM, let us start all over again. The most important thing is to end all types of corruption and nepotism and merit and merit must prevail in Pakistan. @SHER SINGH INDIAN what welfare? Do you even know what he has done? I don't think you have any idea about what you are saying? It's better to read than write without knowing the facts. The government will complete its term. In my humble opinion the verdict of the Panama case against the PM will be neutral,not to the expectations of the people of Pakistan and this could lead Pakistan into another crisis in the coming years. Tomorrow's 2pm will be a game changing pm, pm will hold its office or pm will drive smoothly the office. There may not be any elections before a complete clean up of the system under a care taker setup. In any case if people want change then they should change each and every member of both lower and upper house and all proventional assemblies.If they elect same then expect more of same for an other long period of time. “Qauid tera aik ishara hazir hazir lahu hamara"
PMLN looks like MQM's hey day version! Corruption is the name of the game. I think there are few good things that have happened during Nawaz Sharif's current term as P M, but no person is indispensable. If he resigns, another member of his party will replace him as long as the Party enjoy majority in the Parliament. The Party may choose to have an early election...see what is happening in U.k. This is the way to go. There should be no riots or imposition of will by those who have arms in their possession. What is disturbing about the whole episode is that there is no feeling of guilt...wrong doing...conflict of interest! Finally, it's time for Nawaz Shareef to face the music and corruption charges. PM Nawaz Sharif should have the moral decency to step down, since his family was implicated in undeclared wealth, money laundering and shady deals to acquire expensive properties in London. British PM Cameron as an honorable leader respected by the world, stepped down when his father's investment was mentioned in Panama dealings. The people of Pakistan demand accountability as no politician or his family can be above the law. We demand justice. @SajjAD RazZA These wins can only be attributed to PMLN having entire election system under its control and a sad mindset which encourages voting for those who are already in power. In reality the entire Pakistani nation is badly frustrated with PMLN. Whatever, he had been lying in the parliament, the court and everywhere. @Zia u c truth tomorrow every Indian is hoping retention of Nawaz reign tomorrow. Morover he was only prime minister who initiated development in Pakistan. Maintaining relationship with afghanistan and India. He is an expert diplomat, a wise politician and a successful prime minister. PMLN's self-deception on display for all to see. @jawaid PMLN and competent can't be used in the same sentence. It seems most people had made up their mind guilty verdict for NS and won't accept any other verdict and they will be shocked with actual verdict. @Pakistani There will be a stiff competition between Danial Aziz, Talal Chaudhry and Saad Rafique. But I feel Danial Aziz to be the favourite to win this coveted title. Yes fresh elections after election reforms,like invoking Propportional Representation, and cleansing of bad guys from all political parties. No extra ordinary spendings on election campaigns. No smeared or tainted politicians be allowed to contest. Full powers to Local Governments.More powers to NAB Ombudsman FIA,and other anticorruption agencies.There should be cuts and sealings on perks,pays,expenditures of ligislatures.No protocol or security from state or tax payers money. Either arrange self private guards or if still felt unsafe,better leave the post. No VIP or VVIP culture should be tolerated. Art 25 of Constitution says all citizens equal before law.Austerity measures be imposed & final on all legislatures. @The end is near No this time he should be forced to live in a slum area to see how he has not done anything for the poor! @Iqbal Hadi Zaidi The Govt to be dissolved in case of the verdict against and a CEO to be put in place by the establishment. I do not want to name names but Gen. Mushraf will be the best choice with his 8 years experience in power. Till elections are held. The leaders (complete families) of the 2 largest parties to be put behind bars and the looted wealth to be retrieved by any means necesssry, and to be pumped back in the economy of the country. There is no other way of saying, but in a true Islamic rule the verdict of looting the wealth of the country is death not once but many, many times over. IN case if the verdict in favor - that is a scanerio that should not happen. We the people of Pakistan just might be celebrating on every 20th of April from this day forward. Good News for us Pakistani Patriots. Change is coming and it smells so good. Smells better than my grandmother's nihari.